I travel enough that if I forget to make a car reservation I don't sweat it too much. I know I'm going to get there. Well I went to Chicago last week to a client within four miles of MidWay Airport. I realized Sunday night I didn't have a hotel reservation yet, but went to bed anyway having to get up at 3:30 AM for a 6:00 AM flight. It's a big city right, no worries. Well there was a hugh end of season convention going on and the city was booked solid. Sitting in the lobby of one of the hotels at the MidWay Hotel cluster, online trying to find a hotel with a room, I finally found one 15 miles south of the city and called for a cab. He took me for a ride to the tune of 60 bucks. So when I saw the Enterprise Car Rental office next to my new hotel as I pulled in I was psyched. I'm not paying 60 bucks each way for the week. Beep, beep, beep... gave way to the alarm system blaring from every corner in the place. There was nobody home. I walked outside and around the corner to look out back. Nothing. Now I'm looking for the Enterprise number to call. 1-800-we'll-pick-U-up, whatever it was. I found the number on the sign and called. "Yes you can help me." My phone call progressed up the ladder to the third person when I saw the local police car pulling in. I told the officer my story and he asked for a picture ID. He took my drivers license and told me to stay right there as he went into the office. I presume looking for any bodies to explain why the door was left open. When he came out he was still waiting for a warrant check he had run on me and when that came back clean, (whew!) he said I was free to go and thanked me for hanging out to wait for him after I had set of the alarm. Had he seen me walking away across the parking lot he said, our conversation would not have been as friendly. I asked if I could take his picture and he said NO. Absolutely no pictures. I had taken a picture of his car and the office while he was inside. The following morning at 7:32 AM I could see three women in the office but my door was locked when I tried to go in. One woman got up and came to unlock the door for me. I asked, "So who left the door open last night?" Another woman piped up that it was her. I told her I hoped I didn't get her in trouble because I was the hapless break-in. She said, "Oh no, that wasn't the first time I've done it." I found out later that it's apparently against the law in Chicago to photograph an officer in the performance of his duty. Who knew? 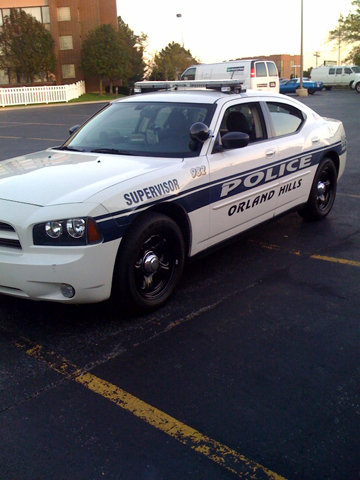 If you're in the greater Chicago area please look for my name in the Orland Park police blotter next week. I could be famous. Or infamous maybe.